Police deployed throughout city to ensure peaceful Ramadan prayers on Temple Mount. The preparations of the Israel Police, which began at the beginning of the month of Ramadan, continued this week in an intensified format throughout Jerusalem in general and within the Old City in particular. The preparations are designed to facilitate rapid entry into the Old City and freedom of worship for the hundreds of thousands of Muslims who attend prayers on the Temple Mount during Ramadan. 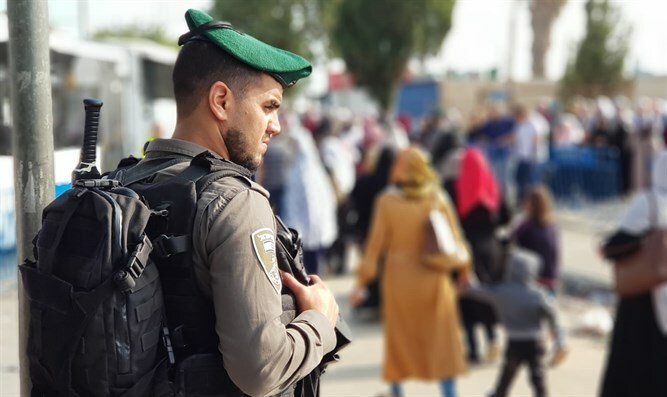 Today, early in the morning, police and Border Police officers were deployed throughout the city and at the crossing points to allow orderly passage of all Muslims to the third Friday prayer of the month of Ramadan on the Temple Mount. Worshipers who arrive for prayer by bus ride will return to the bus at the end of the prayer, to the same location where they alighted from the bus in the morning. "The Israel Police will act decisively against anyone who tries to disrupt the peaceful process," the police said. Between 06:00 and 18:00, the following roads will block traffic to the Old City: Sultan Suleiman, Wadi Joz, Jericho, Shmuel Ben Adiya, the Ophel Road, Nablus Road, Salah El Din, Maalot City of David. Between 07:00 and 17:00, traffic to the following traffic arteries will be blocked: Bar-Lev Boulevard from the Mateh Artzi Junction to the south of the city, Hevron Road from the Hasmonean Street of Miriam to the north of the city, the Paratroopers Street and the Engineering Corps. Between 06:30 and 14:30, traffic will be blocked on Derekh Shekhem Street, Saladin Street, Omar Bin Elas Street.